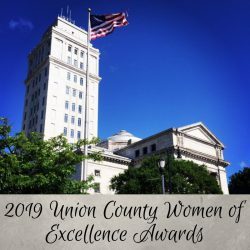 Union County, NJ – The Union County Commission on the Status of Women is pleased to announce the recipients of the 2019 Women of Excellence Awards. Eleven Union County women were cited for their outstanding contributions at the January 24th meeting of the Union County Board of Chosen Freeholders. Each awardee will be presented with an engraved Women of Excellence plaque and a Freeholder Resolution in their honor recognizing their impact on the Union County community. For any questions or to get more information about the Women of Excellence awards program, contact Elizabeth Sebring, Union County Department of Human Services, at 908-527-4890 or esebring@ucnj.org or Jen Erdos, Secretary to the Commission on the Status of Women, at 908-527-4216 or jerdos@ucnj.org.